An on site test of the workability and an indication of the water content of concrete freshly delivered to a concreting site. This test is to quickly determine on site if the concrete is fit to be used on the job. 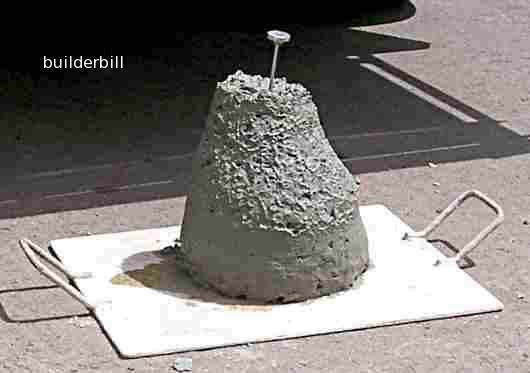 I have heard of site supervisors or testers who have refused to take a load of concrete that does not comply to the range of slump that the specification states. This is a rare occasion as the quality of the concrete coming out of a modern batching plant is of high quality. When the concrete has arrived on the site and the pour is about to begin the concrete tester takes some sample concrete after at least 0.2 of a cubic metre has been allowed out of the mixer. 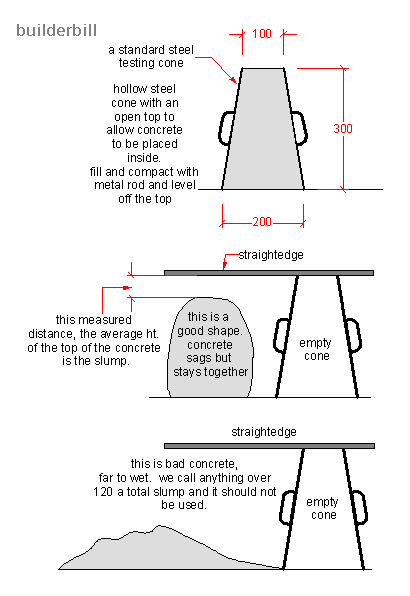 The slump is an actual measurement of the amount that the concrete sags when a sample of the concrete load is placed into a standard test cone, compacted and then the cone removed as sketched above. This may be done for every truck load that is used in a particular concrete pour or it may only be done the once. It depends on have critical the pour is or the job specifications. The concrete above has just had a slump test done on it. It is a pump mix for a house concrete raft slab and it was specified to be 80mm plus or minus 15mm. The measured slump was 85mm so the pour went ahead. The concrete tester makes note of the details of the load, the time of the test and the temperature and weather conditions. As you may have guessed from the dial thermometer set in the top of the concrete in the photo above he also records the temperature of the wet concrete. These details are uploaded to a database on his return to the testing laboritary and along with the compresion tests (see the next page) they will form part of the record of this one batch of concrete.